Local cinephile Don Brown's "The Mind/Body Connection" cinema series at the University of Hawaii-Manoa's Spalding Auditorium continues with two films about the biochemistry of feelings and the mechanics of pleasure. "In the Heat of the Moment" is a BBC production about a landmark study of the facial expressions of native Papua New Guineans. The study suggests that all human beings share six basic emotions. "Stimulants" comes from the Discovery Channel and explores the workings of the human nerve center under the influence of various drugs. The documentaries will be shown 7 p.m. Thursday and 5 p.m. Sunday. Tickets are $5 general and $3 UH students and faculty. Call 223-0130. For art with a difference, check out "Robot Tea Party" Friday at Windward Community College's Gallery 'Iolani. This special interactive installation allows visitors to control a modified remote-control car system with crayon casts replacing the tires, thanks to the art collective AV Club of Honolulu. The performance piece, "Title Track," allows visitors to control the car on a giant sheet of paper, leaving colorful tracks in its wake. Their efforts also help fabricate a trippy sound system as well. "Robot Tea Party" opens 4 to 7 p.m. Friday, and the interactive exhibition will be up through May 2, so you have plenty of time to make tracks, as it were. Check out the latest innovations in technology and the Internet at the 5th Annual 2008 Technology and Internet Expo, noon to 6 p.m. Friday at Blaisdell Exhibition Hall. This year's expo includes seminars, exhibits and live presentations by some of the world's top technological and business pundits and companies. A new Business, Information and Technology conference component has been added to give attendees the choice of more seminar sessions with a diverse lineup of speakers. The conference will focus on four key topics that impact the daily life of every business in the islands: green technology, cyber security, e-Biz and medical technology. Admission is $3; call 237-3673 or visit technologynewsbytes.com. Green Door Cafe in its new location at Kahala Mall. Betty Pang had been running Green Door Cafe in downtown Honolulu for about 2 1/2 years when she made her move last December to the revolving-door space behind Kahala Mall. Considering the brief tenure of recent tenants, I didn't think it was such a great idea. 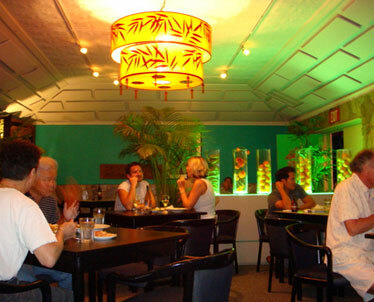 I envisioned the larger room would mean a shortage of hands, slow turnaround in the kitchen and a personality clash with Kahala denizens unfamiliar with Betty's straight-talking ways -- an acquired taste -- matching her no-nonsense, give-it-all-you've-got cuisine. She might appear to be the ultimate temperamental restaurateur, but it's only because she cares about food above all else, and so what if pleasantries fall to the wayside? What are you here for anyway? The eco-conscious will be happy to note that she no longer uses Styrofoam boxes as plates, replacing them with proper china. And the food remains as addictive as ever. How else to explain her Chinatown clientele's willingness to follow her to suburbia? Years of eating for a living has conditioned me to know when to stop, but here, I ended up being quite unwilling to do so. That's the spell of Malaysian chicken curry ($8.75) saturated with the flavor and grittiness of fresh ground spices, and fish steamed in banana leaves ($14.75) and topped with diced celery, tomato and cilantro. Even mushroom chicken ($13.75) is not the milquetoast dish one would imagine. Here, organic Big Island mushrooms loom like penne in the sauté of garlic and white wine, liberally doused with black pepper. Betty has the space for a year, so try it while you can. Hopefully, her next move will be closer to where I live. Open 5 to 10 p.m. daily. Costs about $20 to $40 for two. Sunset on the Beach in Waikiki today and tomorrow has been canceled due to forecast rain. The event was listed at the top of this page, which was published online before the cancellation notice.